Hand crafted in a small rural town of North Carolina, you'll have to stock up on birdseed with this feeder. Birds love the spacious feeding area, which is protected from rain and snow by an expertly crafted cedar roof. Your guests will marvel at the detail and workmanship of this feeder, thought by many to be the finest example of craftsmanship available in a feeder today. 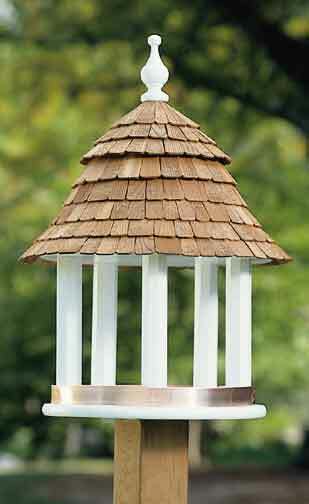 The copper band encircling the base helps contain the seed and creates an attractive polished accent to the base and cypress structures. Painted with three coats of your choice of white or stained gray, it is a full 17 inches diameter x 24 inches high. Please make your selection as to color. Weighing 12 pounds, ABirdsWorld.com is offering free shipping charges anywhere in the continental US. Exquisite detail and hand crafted elegance make this feeder one of our most popular sellers. Upon arrival you will agree that this feeder lends an immediate air of distinction and aesthetic tranquility to any garden or backyard habitat. Constructed of high grade cedar and cypress, hand painted, this piece is sure to remain an heirloom in your family for years to come. Featured in fine gardening magazines and exclusive garden shops, the normal retail price for this feeder exceeds $350. Perfect for a special gift for the gardener's and bird lovers on your list! Take advantage of this incredible price and shipping offer by ordering this classic heirloom feeder today!"